Port Townsend has become a very popular destination spot as there is so much to do. Just recently Port Townsend made the “Best List” in Fodors, USA Today,AARP and the Seattle Times for a variety of topics, including best retirement town, most quirky town and best Farmers Market. If you've done any sort of research on this little town, you'll know a lot of the activities center on boats and boating, with the wonderful boat yard and world famous Wooden Boat Festival. And you've most likely heard about the Victorian houses and Centrum concerts and other sites that are popular. Having lived in the Port Townsend area for more years than I care to think about, friends and I have come up with our "more than 7 list" of different things to see and do while visiting. And of course, it's for locals, too as we all know how when we live somewhere for a while, we tend not to do the "touristy" things. These are not in any particular order or preference. When I first lived in Port Townsend, the house was right up on top of Morgan Hill. At the bottom, was a small local market, called Aldrich's where more often than not, we were served by a young man with an enormous mop of dark curls. Young Rocky Friedman went on to fulfill his dream, restoring the old Rose theatre, bringing first run movies to the little town. Since then he has gone on to create the Rosebud (a tiny, intimate theatre) and more recently, the Starlight Room. From the Seattle Times: "The Starlight Room itself is gorgeous — high ceilings, big windows (curtained, of course, when movies are playing), a graceful assortment of soft-colored vintage couches and chairs, chandeliers, the whisper of history. There’s an elegant little bar outside the main room, where you can get a cocktail or a Silverwater snack, and the whole experience just feels first-class." The Rose also sponsors the Port Townsend Film Festival that draws visitors from all over the world. Centrum is central to Port Townsend's cultural identity. It all about the arts and so much of it is shared during the amazing workshops that are held mostly during the summer. A couple of weeks ago, during Jazz Week, I was lucky enough to attend one of the free concerts which was held out at the Fort, in the open air. The music was amazing - and I am not a jazz fan! The musicians were all youngsters attending the workshops. Living in this little artsy town, it's easy to forget about the talent that thrives here and to forget about Gallery Walk. (I did, last month.) Water Street, our main road through the middle of town is filled with wonderful art galleries and each month they stay open late that 1st Saturday with many providing wine and hors d'oeuvre to their wandering guests. This is a monthly event and is held year-round. The Boat haven is a great place to visit. Spend the whole day around the boats. Besides seeing a huge variety of boats in and out of the water and see the great work the shipwrights do, you can have some of the best coffee you might ever have had Sunrise Coffee. My favorite is the Heavy Haulout. All the blends are roasted right there and all the labels are works of art themselves, created by local artist, Max Grover. 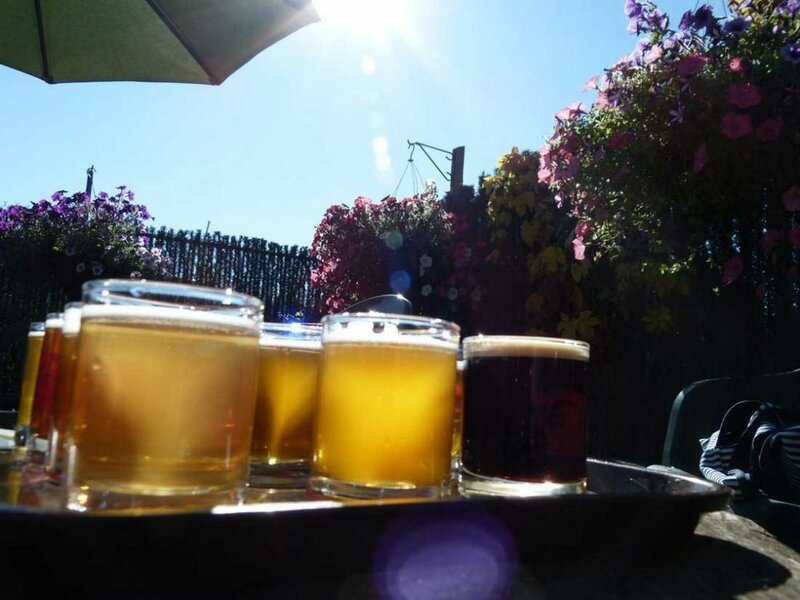 Then have lunch at the Blue Moose in the boatyard where the boat workers go for good food and then go for a beer at Port Townsend Brewery, where they have excellent local brews and music in the beer garden on Friday afternoons in the summer. This is one of the whackier events in a town known for the unusual! Way back, I was a Kinetic Kop, handing out ridiculous tickets for a variety of infractions! Now in it's 32nd year, the krazy contraptions recently took to the water, the streets, sand and mud! As the third oldest race on the ever growing Kinetic Racing circuit, it is one of the few still run by volunteers. "These kineticnauts and their wacky Kontraptions have won the hearts, and imaginations of all who witness this eccentric, eclectic pageantry of human powered machinery." No trip to Port Townsend is complete without a trip to Elevated! Home made, seasonal and local! When my mother visited years ago, she discovered the Swiss Orange Chocolate Chip ice cream, so every time we went downtown, we had to stop for a scoop. A few years ago, they added the candy store, which is dangerous! You can buy the world-famous chocolate slugs on a stick here. So that's just a sample of what you can do and see in Port Townsend, Washington. Below is a partial list of some of the PT "happenings" during the year. You can see a lot more at the PTGuide.